Kochi: Jatayu Nature Park, Kerala’s first PPP project in tourism sector, has opened a new chapter in the history of tourism in the State. Even as the entire facilities in the Rs 100-crore park would be available for public by December, the official inauguration is slated for July 4, sources in Kollam District Tourism Promotion Council told The Covai Post. Maintained by Jataypara Tourism Pvt Ltd, the project is a beginning of huge change the tourism sector was expected to witness in the coming years. The Government had come in for sharp criticism from the public and industry for not showing professionalism to woo tourists. This had led to many tourists skipping the State and preferring other locations. This project has helped in addressing this issue. The practice of budget tickets has been done away with here. The ticket for entry into one segment named ‘Adventure Tourism’ costs Rs 1,000 to Rs 3,500. The facility, having about 20 categories, opens at 9.30 am and closes at 6.30 pm, sources said. Another segment of cable car travel costs Rs 400. Situated along MC Road at Chadayamangalam in Kollam, the park was partially opened for the public a few days ago. 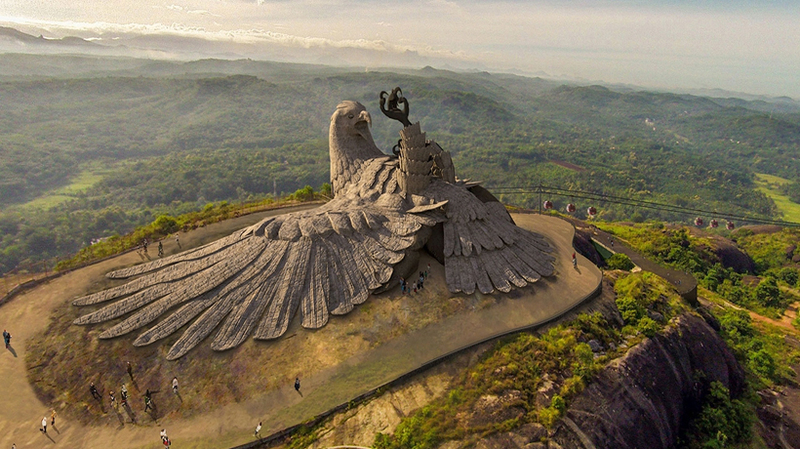 It has the world’s largest bird sculpture of the mythical jatayu perched on the rock formations 700 metres above sea level. The sculpture is 200 ft long and 150 ft wide and 70 feet and is spread across 15,000 sq ft on the rock. The park was opened partially on December 5 last year. Delivering water on top of the hill was a real challenge as two rocks were fused together to form ar reservoir. The project was executed under the leadership of director Rajiv Anchal. Legend has it that Jatayu fell on the rock bleeding after a valiant attempt to save Sita from Ravana. The visitor will get feel of treta yuga in the museum and the 6D theatre where the picture to be shown is under production in Hollywood. The Rs 65-crore Jatayu Earth Centre is the first Build Own Transfer project to be taken up in the State. Other facilities include two helipads and a local flying service, installation for bird’s eye view and an ayurveda and siddha cave resort.